I'm building this robot out of an old printer that was laying around. It is nothing like your normal printer cause, well, its HUGE! The dimensions of this beast of a printer case are W-26.7", L-24", H-10.7". Picking up the printer proved qutie a task...EMPTY. It seems the bottom half is made out of steel I'd assume considering its weight. The printer case is also very sturdy as I have proven by standing on the top half(which opens), I weigh around 180 lbs, 175 on average. I will attempt to weld an internal chassis to put into the casing as support and a place to mount everything on. Lets just hope arc welding will come natural to me. I was thinking of using the case's brute build but I thought that was kinda boring, plus I didn't think I could obtain the proper motors to be a brute force robot. So I had to come up with a weapon that I could put together and if possible, have it dual purpose if it decides to malfunction. So I threw around some ideas and thought the idea of flipping someone up in the air would be nice and would be a crowd pleaser. Since I didn't wanna imitate Vlad The Impaler in its lifter/flipper design I thought of a plow. I haven't seen a bunch of plows that functioned so I had me a weapon. This is only my first plan that I am thinking of using, this may change. I drew up how I would like it to look and went into trueSpace 4 and made a basic copy of the printer case, then I added a plow and animated it and a sample pivot point. I rendered it for real time viewing here. For the plow weapon, I have two basic choices for putting it into action. 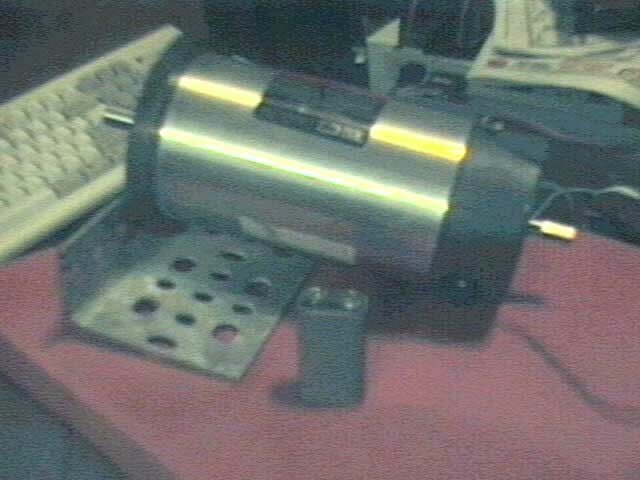 I can either use a powerful motor with a chain drive to rotate an assembly attacthed to the arm, or I could use pneumatics/hydralics. At the moment I'm leaning towards pneumatics in the form of CO2. It is quite fast at moving something from point A to B and I need to learn something about pneumatic systems anyway. I also have read that CO2 in liquid form has a great capacity than standard compressed air and it would proably last longer than a motor that is running along side the drive system motor current draw. It also simplifies the amount of high current electrics required. I went down to a local surplus store to see if they had motors. This is a picture of one of the 36v Servo motors I picked up for $10 each. I also picked up a rather large UPS battery but it'll be for testing. I may run these at 36v if I have the room(and the batteries), but they turn pretty good at 24v. The draw about 20amps a piece when stalled(I think thats how I read my multimeter), so they aren't no Bosch 750Ws(anyone wanna donate me some? :) ). To keep cost down, I plan to build my own. Decided that I may want more than one weapon so I'm going to attempt to design in a rear attack axe/hammer for anyone that attacks from the rear or if I happen to be facing in that direction.